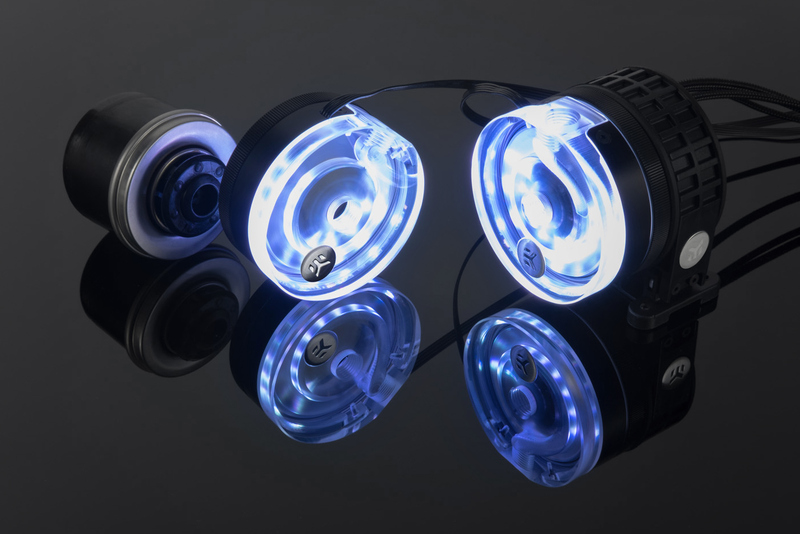 The RGB version of the popular EK-XTOP Revo D5 pump is now available! 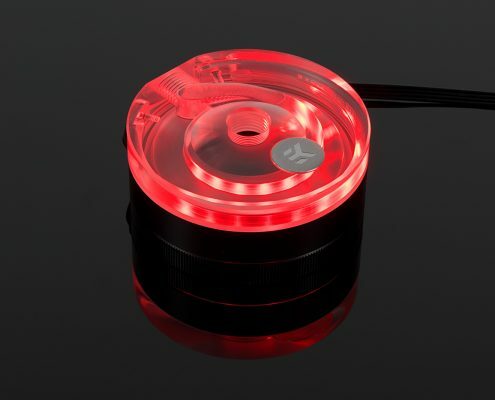 EK® Water Blocks, the world-renowned premium liquid cooling manufacturer, is releasing the EK-XTOP Revo D5 RGB PWM pump unit and a stand-alone EK-XTOP Revo D5 RGB top to upgrade your existing trusty D5 pump. Meaning, the very popular and successful EK-XTOP Revo D5 PWM pump is now available with an integrated 4-pin 12V RGB LED strip and dense high-quality PET black sleeving on both the PWM and power cables as well. Both products are compatible with popular RGB sync technologies from all major motherboard manufacturers. The arrow marking on the 4-pin LED connector is to be aligned with the +12V marking on the RGB header. You can easily remove the LED strip cover which is mounted with two screws to replace the LED strip with some other type LED strip. Both the EK-XTOP Revo D5 PWM RGB pump unit and the stand-alone pump top are available with an integrated 12V RGB LED strip which is connected via a 30cm 4-pin cable. The EK-XTOP Revo D5 PWM RGB pump comes with 50cm long power cable and 60cm long PWM signal cable which are equipped with black high-quality dense PET sleeving. EK-XTOP Revo D5 RGB PWM is a high-performance liquid cooling pump, built around the market-proven Xylem D5 PWM water pump and revolutionary EK-XTOP Revo D5 pump top with an advanced vibration-reducing mounting clamp. 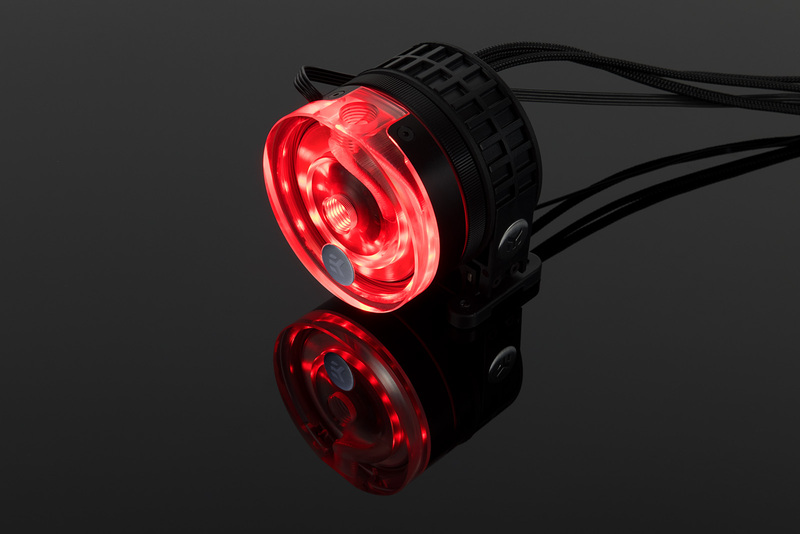 The D5 pump is equipped with an electronically commutated spherical motor. In a pump with a spherical motor, the only moving part is a spherically shaped rotor which in this pump is held in place by a bearing ball made of ultra-hard and wear-resistant ceramic. The Revo D5 pump volute/body system features a fully rounded design thus offering greater usability, allowing installation at any angle within 360° of rotation. Special rubber shock absorber is used to de-couple the main pump body from the mounting clip for silent operation, free of vibration induced noise. Additionally, horizontal and vertical positioning is supported for easier tube routing possibilities. 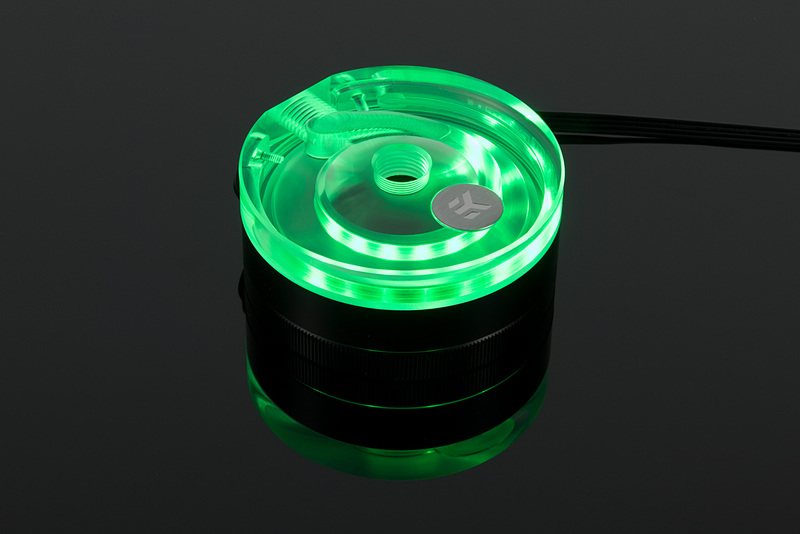 EK-XTOP Revo D5 RGB is a high-performance aftermarket pump top which comes with an advanced vibration-reducing mounting clamp for Xylem D5 series water pumps. This stand-alone pump top comes with a pre-installed 4-pin 12V RGB LED strip. 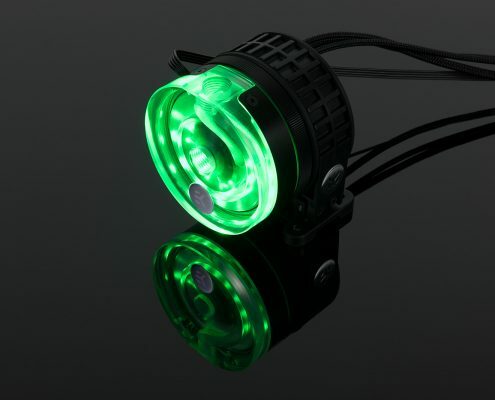 EK-XTOP Revo D5 RGB PWM and EK-XTOP Revo D5 RGB are made in Slovenia, and it is available for purchase through EK Webshop and Partner Reseller Network. In the table below you can see the manufacturer suggested retail price (MSRP) with VAT included.